The heavy-equipment maker earned an adjusted $US2.86 a share, edging out the $US2.85 that Wall Street analysts surveyed by Bloomberg were expecting. Revenue soared 18.4% versus a year ago to $US13.51 billion, topping the $US13.29 billion that was antcipated. 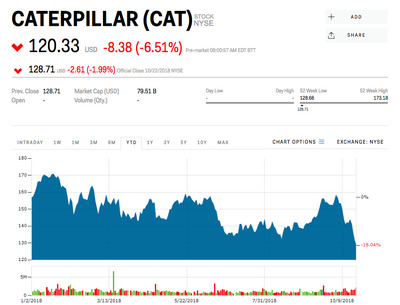 Caterpillar reaffirmed its adjusted-profit-per-share outlook of between $US11 and $US12. “In the fourth quarter, price realisation, operational excellence and cost discipline are expected to more than offset higher material and freight costs, including tariffs,” Caterpillar said in the release.